It was a night of stylistic diversity and intense performances on "The Voice." When live performances kicked off Monday night on "The Voice," the dwindling singing hopefuls left weren't taking any chances, at least not if their no-holds-barred performances were any indication. The members of Team Blake and Team Adam were singing for their shot at sticking around in the competition Monday. The members of Teams CeeLo and Christina are set to perform Tuesday. And what Adam's and Blake's teams didn't have in the way of gender diversity — there are only three women among the team's collective ten members — they made up for in stylistic diversity and performance intensity. 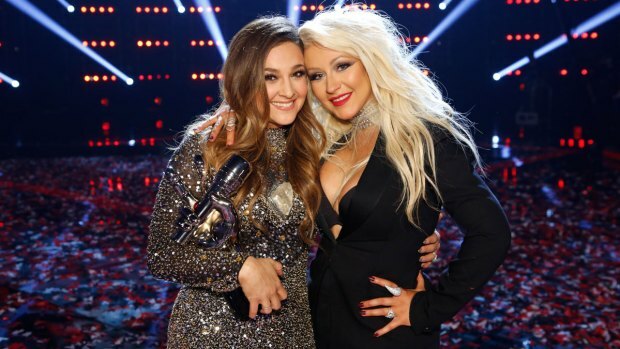 After Christina Aguilera herself kicked off the night with a performance of "How I Feel" alongside Flo Rida, Team Blake's lone lady Shelbie Z. prepared to head to the stage with an outlaw country riff on the Reba McEntire hit "Fancy." Blake warned Shelbie that she'd need to sound massively confident to pull it off. "Do [Reba] proud," he advised. "No pressure!" After she took her take on "Fancy" onstage, replete with her pouty strut, the coaches agreed that Shelbie succeeded at that. "There's no doubt that when you get on that stage, you bring it home," Christina told her. Next up was one of the boys of Team Adam, college dropout turned Apple store geek James Wolpert. A former singer in an a cappella group, James gravitated toward stripped-down arrangements, but he also said he felt naked without a guitar. The solution: A take on Joni Mitchell's lovelorn classic "A Case of You." Christina called James' crystal-clear performance of the song "heart-warming" and gave him credit for having "ground yourself in the song." But Adam's praise was warmest. "I knew there was something in you that we hadn't seen yet," he said, crediting James with a major comeback from a shaky performance in the knockout rounds. "You came back, did something incredibly bold, and you were so controlled and had so much poise and were so incredibly elegant." Next up was James' one-time teammate Nic Hawk, now an unlikely member of Team Blake, replete with his David Bowie-esque hair (mid-'70s era, that is), infectiously bouncy stage presence and uncanny rapping abilities. Nic's performance — not just of Robin Thicke's part but of T.I. 's, too — wowed the coaches, not least his own. "You're the complete entertainer; I can't say it enough. O.M.G.," Blake said. A very different Team Blake boy, young father and "swamp-pop" singer Ray Boudreaux, was up next, with a take on a hit by another bayou-inflected singer from his own hometown of Lafayette, La. : "Home" by Marc Broussard. After Ray finished his performance, Christina praised him for his "realness," Adam for pulling off a "hard song" with aplomb and Blake for the fact that he has built awareness of the Delta blues style he so loves, all with his "soulful" style. Another soulful member of Team Blake from across the country hit the stage after Ray. That performer was Austin Jenckes, a scooter tour guide with a Paul Bunyan air. Blake assigned him to sing the Black Crowes' "She Talks to Angels." "He maintains his strength, and he's got a tender side," Blake commented before Austin performed, and after he did, Christina made a similar observation. "You sing, Austin, with so much heart," she said. Next came another several members of Team Adam, starting with one of its two women, Grey, a wedding singer who wanted to break out of the wedding band mold. In the hopes of pushing her out of her safety zone of covers and into edgier territory, he tasked her with performing Paramore's "Still Into You." "Grey needs to perform this song and convince us that she can do it all, because I think she could be the dark horse in this competition," Adam explained. Onstage, she performed with her trademark comfort and ease, and the coaches praised her confident vocals and playful spirit on the song. Her teammate Will Champlin — member of Team Adam by way of Team Christina by way of Team Adam, if that makes any sense — came next, well aware that as a singer who had stood on the precipice not once but twice and been stolen both times, he needed to give a stellar performance. For that, he picked OneRepublic's song "Secrets," which he'd come up with a piano arrangement and stage plan for. ("As a musician, piano is my passion," he said.) The tack won over the coaches, with CeeLo calling his performance "very dynamic, very definitive." "You deserve to be here as much as anybody else," Adam said. "You have a very special gift." Team Adam's longtime Christian rocker Preston Pohl was performing next, ready to celebrate his dad's apparent victory after a battle with cancer. "Preston is a unique singer," Adam remarked of his charge. "He's in the business of making things his." He did that on "The Voice" stage with B.o.B. 's hit "Nothing on You," earning plaudits from the coaches for his natural, soulful grit. So did Team Blake's final performer of the night, Cole Vosbury, who performed Rod Stewart's "Maggie May" next. Finally, Team Adam's resident diva Tessanne Chin, a cheery Jamaican back-up singer eager to break out on her own, was performing a song laden with personal meaning for her: "Many Rivers to Cross," by reggae legend Jimmy Cliff, for whom Tessane had long sung backing vocals. Kidding aside, the coaches made no bones about their love of Tessanne's performance and respect for her vocal talent. Her own coach Adam went one further. "Let's just put the talent aside for a minute," he said. "This woman — you have just such a golden soul." When "The Voice" returns Tuesday, members of Team CeeLo and Team Christina will get their chance to sing for audiences' votes. NBC will also air a special results show on Thursday. "The Voice" airs Mondays at 8/7c, Tuesdays at 9/8c, and Thursday at 8/7c on NBC.